Switching hands – why does my child swap hands in fine motor tasks? My Child Is Switching Hands! Switching hands is often seen in young children, who may often swap hands while painting, coloring, or eating with a fork/spoon. It is not usually a concern when a toddler or young child swaps hands, as they are still learning how to use their hands well together, and trying out what feels right for them. However, if your child is still switching hands when entering formal schooling, this may affect important school skills, such as cutting out with scissors and developing handwriting skills. In order for your child to do well at learning to write, there has to be a dominant, strong hand that becomes specialised at doing the job of controlling the pencil. These suggestions are intended to encourage your child's normal handedness development. If you suspect your child has hand dominance delays, please seek a professional opinion. Here are some questions to consider when your child swaps hands. Are your child’s bilateral coordination skills poor? Does your child usually begin fine motor tasks with the same hand, and then swap hands when feeling tired? Does your child use the left hand when things are presented on the left side and the right hand when things are presented on the right side? Does your child seem to pick a hand at random and swap at random? Learning to use both hands together in a coordinated way is actually an important first step in developing a specialised, or dominant, hand. Your child needs to be able to use both hands together at the same time (symmetrical movements), use both hands together in an alternating way (reciprocal movements) and to use one hand as an assistant to a “specialist” hand in an activity (such as drawing a line with a ruler, spreading butter on bread). Remember, as well as wanting a strong, dominant hand to emerge, we also want the “other” hand to become a good “assistant”. Check out my free info and bilateral activity ideas here, or you may want to try my bilateral coordination activities e-book! Does your child usually begin fine motor tasks with the same hand, and then switch hands when feeling tired? You may well see your child “shaking out” their tired hand, and then swapping back to the first hand when the hand feels more rested! You can help your child strengthen their dominant hand with lots of scissor cutting activities, and hand strengthening exercises. Working on shoulder girdle stability and core muscles may also help to improve your child’s overall endurance of fine motor activities. If your child does not start with the same hand regularly, then encourage fine motor activities that use both hands equally (such as playdough, paper crumpling, lego etc) to give both hands a chance to get stronger. Always present activities in the centre of your child’s body (midline) so he/she can reach for them with either hand. For convenience, try my e-book packed full of easy fine motor activities to do at home! If this is the case, then there may be some delays in crossing the midline. If your child avoids crossing the midline, you may notice that the left hand gets used when the tools are given on the left side of the body, and the right hand when the tools are given on the right side of the body. 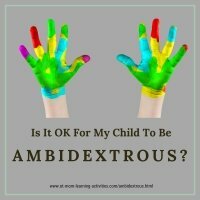 If this occurs, then both hands will tend to get equal practice at developing skills, and your child’s true handedness may be apparently delayed. Always try and put pencil, paper, scissors centre in front of your child to see which hand is naturally used. Try some fun activities for crossing the midline to help your child develop this skill. 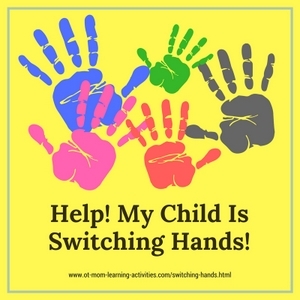 Does your child seem to be switching hands at random? Switching hands is common in young children, but children who are about to enter formal schooling need to be working on establishing a preferred hand. 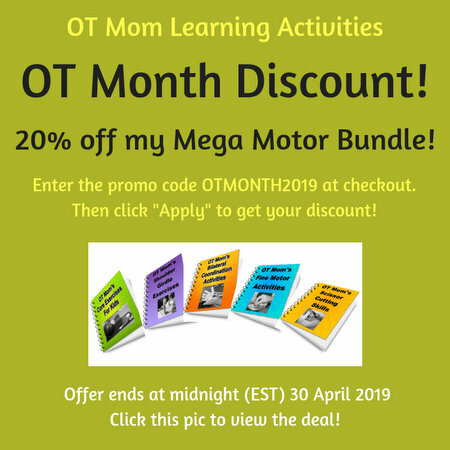 Occupational Therapist Katherine Collmer gives some activities and tips that may be helpful in determining and promoting the use of a dominant hand in young children. If you and/or your child’s teacher are concerned about your child’s switching hands, and it is interfering with the development of skills that they need for school and self care, then please make an appointment with a pediatric occupational therapist. Please never choose a hand for your child. This can have horrible long term consequences, and I speak from experience from working with children who were forced into a specific handedness. An occupational therapist can help to get to the bottom of your child’s particular difficulties (remember, every child is different!) and will develop a treatment routine specifically for your child. I hope you found this article helpful! Why not sign up for my occasional, free newsletter to keep in touch with new and updated pages on my site? Home › Hand Dominance › Help! My Child Is Switching Hands!